Buying a luxury home isn’t as straightforward a process as one might think. This market has a lot more variables when it comes to each property, making it difficult to establish an exact market value on a home. That being the case, buyers may wonder if they’re getting a fair price on a luxury piece of property. If you’re in the expensive real estate market, here are some steps to take to ensure that the price for your home is fair. It should be said that comparing two luxury homes isn’t the same as comparing other types of real estate. When you buy a “normal” home, your REALTOR® will look at similar homes in the area, keeping in mind the number of bedrooms, bathrooms, etc. Luxury homes aren’t built with that in mind. When you compare these types of homes, you may want to look at features like great views (if it’s a penthouse, for example), privacy, sports features, etc. This gives you an idea of what’s on the market. Once you’ve looked at a couple of properties and have had a chance to compare them, you should be able to develop a “must-have” list. Think about your financing options as well. All of these will become a factor once you’re ready to buy. Like any other profession, the real estate market has professionals that specialize in high-end homes in certain areas. These REALTORS® know what properties in the area are going for and how to find good deals. Additionally, real estate professionals can tell you what types of transportation amenities are in the area. This is especially important if you’re moving into an area that’s very different from your current location. Hiring someone who knows how the flow of a geographic area works will be better able to steer you toward a good location. Once you’ve done the first three steps, you’ll finally want to start narrowing down the properties you’re looking at. It’s at this time that you’ll be able to make an offer on a home and, more importantly, hopefully, get it at a fair price. 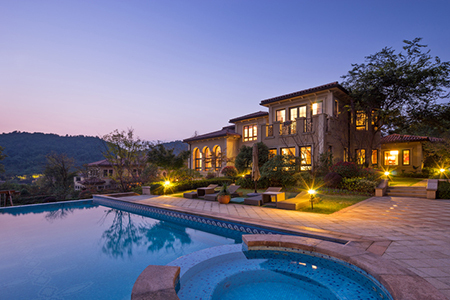 Luxury homebuyers should consider the timing of their purchase. They may be able to get a better deal on a home in the winter than in the summer. The same can be said for homes that go up for sale at the end of the year. These homeowners may want to get rid of the property by year’s end for tax purposes. Additionally, you may also be able to secure a luxury home at a reasonable price if the seller is motivated to sell—but be warned. Homes priced to sell go fast, in sometimes as little as two weeks. If you find a luxury home at an excellent price, be sure to ask your real estate professional to make an offer on it. Buying luxury real estate at a good and fair price is a process. You should start by doing some research and by hiring a real estate professional who specializes in the luxury market. From there, compare the different homes on the market. Finally, once it comes time to buy the home, look for a motivated seller. This factor, combined with all of the previous work you’ve done, will help ensure that you’ve gotten the best price for your new place.